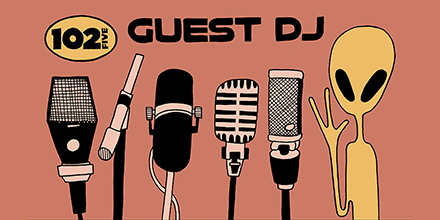 ALWAYS WANTED TO BE A GUEST DJ, BUT DIDN'T KNOW HOW? Sit down for a few minutes to make a list of 12 to 14 songs that are a combo of both your shining personality and CD102.5 of course! We ask that at least half of the songs are CD102.5 artists, but tracks selected do not have to be the songs we play or have played - so let the creative juices flow. If your list is selected, you'll get your hour of fame on Sundays at 8pm! Appease the Mighty Radio Gods by sending your list to guestdj@cd1025.com with "GUEST DJ" in the subject line. Guest DJ's must be 16 years old. If under 18, you must have a parent or gardian accompany you. Looking for Past Guest DJ's? Below is a list of the last couple weeks or just type in the name you are looking for in the search bar.